When Netatmo presented its ‘weather station for smartphones’ in 2013, nobody could have imagined that it would be relevant five years later. Netatmo has expanded its ecosystem, improved the integration of its components into smart home systems and enabled integration with digital assistant. This new review is intended to show how the Netatmo weather station for smartphones has now become the weather station for smart homes. 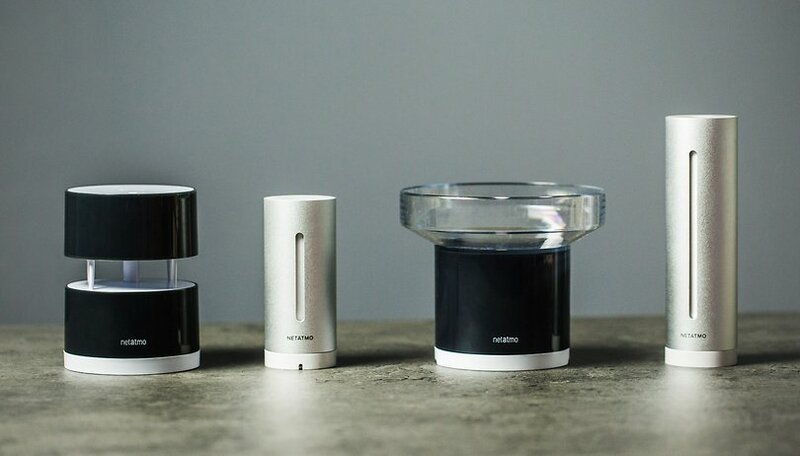 Netatmo provided us with their complete weather portfolio. The devices have a one-off price and there is no subscription fee for the online service. The purchase price of around 150 dollars has stayed the same since its initial release in 2013, which is remarkable in itself. Only a few technological products are able to retain their value for this long. Apart from the first indoor module (base station), the Netatmo devices work with AA or AAA batteries, which should last for one to two years. Netatmo also markets cameras, door sensors and thermostats, but we’ll consider these separately in other reviews. Externally, nothing has changed on the Netatmo weather station since its release in 2013. The starter set still consists of two silvery cylinders, one slightly longer than the other. One is for inside and one is for outside. Our test system additionally consisted of an anemometer, or rain gauge, and two holders for the gauges. The system can be extended with additional components. The wind and rain gauges that we were provided additionally determine the amount of precipitation as well as the wind speed and its direction. Netatmo creates historical graphs from the collected data and extrapolates a prediction from your station’s measurements in conjunction with the stations in your area. In my opinion, Netatmo would’ve been happy to ship the outdoor sensors with a mount free of charge. To pay another 25 dollars for them is excessive because they are obviously necessary, especially if you consider the bracket's manufacturing is rather simple and the installation shows that the materials are not on par with the quality of the measuring instruments. In recent years Netatmo has not only increased the number of countries where its products are available. It has also increased the number of web services that can be used to control the devices. Thanks to a Facebook bot, you can check the temperature in your home thermostat via Facebook Messenger. Thanks to its connection to Alexa, you can find out how warm it is at home and on the road via voice control. Thanks to Conrad Connect or Athom Homey, you can trigger smart home actions when Netatmo measurements exceed or fall below certain values. Thanks to its popularity on the market, every well-known smart home service integrates Netatmo into its portfolio. It does the same thing for temperature control that Philips Hue does for smart lighting. Netatmo values are also collected and displayed collectively on maps. This creates a kind of community-based weather service. The Netatmo app itself is clearly structured. The start page gives you an overview of the current sensor data. In case of a thunderstorm you will receive notifications, and you can change the thresholds for notifications yourself. If you turn the phone on the main screen 90 degrees into landscape mode, the app switches to another mode. Then it shows the historical graphs that Netatmo stores for free in the cloud on your account. Through the menus you can manage the connected sensors and other devices as well as the connected web services, which are allowed to read the measurement data of your Netatmo devices in your name. The step-by-step instructions on the screen make it easy connect new sensors. To access your Netatmo without the app, you can also use the web interface. This displays all measured values in a dashboard, which also makes it possible to access the targeted thermostats and cameras. Using Facebook Messenger is optional. The Netatmo bot understands simple standard questions and sends current measured values. Of course you first have to allow it to access your Netatmo account. Due to the variety of measured values, it can also be useful to use Netatmo as a warning instrument or as a first device for a smart home system. With services like Conrad Connect, you could change the light in a room and have a warning SMS sent, for example, if the CO2 level critically rises. IFTTT is also full of additional Netatmo functions. It’s this connectivity that answers the question ‘do I really need that?’ in a completely new way. In 2013, the smart home infrastructure wasn’t yet as developed as it is today, so Netatmo was quite alone with its data. If the CO2 value rises alarmingly, you can now automatically open a window or switch on a ventilation system. The links and devices have finally arrived; the remaining gaps will close themselves. Netatmo certainly hasn’t launched a cheap product line. With the long-term support, however, the brand proves that it has pursued a clear plan right from the start and remained true to it. This makes the smart home accessory a good long-term investment and also a good recommendation for new customers. Initially, the Netatmo sensors were more or less toys for hobby meteorologists, but now they have become important sensor instruments in a mature smart home ecosystem. Together with other control units in your house, they allow inexpensive and reliable home automation based on the data measured by the Netatmo weather station. Your house can thus sensitively react to weather events and help you save energy fully automatically, so the high purchase price quickly pays itself off.